Born Again Pews builds more than just church pews. While church pews are our foundational product, we can make almost anything your church needs. 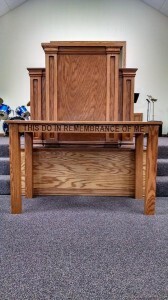 We offer other church furniture, including pulpits, communion tables, and other church accessories. If you have a special need during your renovation project for your church, we can usually help. On top of being able to meet your church’s needs, you’ll also get all your church furniture in a matching set, like Amity Baptist in Hackett, Arkansas. We recently installed church pews, a pulpit, and a communion table at Amity Baptist in Hackett, Arkansas. 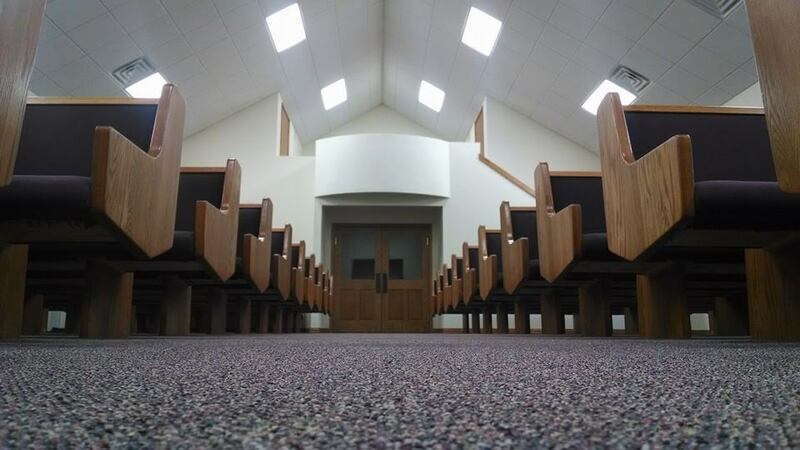 The church opted to get all three types of church furniture from Born Again Pews at once because it was easier, more cost effective, and the pieces match each other better than picking and choosing between companies. 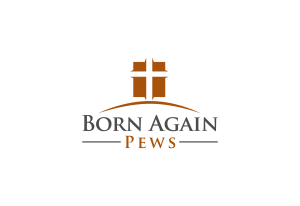 At Born Again Pews, our prices are often so affordable that buying multiple items from us is more economical than shopping for bargains from many different companies. The church furniture we made and installed for Amity Baptist is made in matching solid wood with the same finish and style so that everything looks like it belongs together. The church pews, pulpit, and communion table all have the same wood, same finish, and same style. When you work with Born Again Pews, we can make what you need for church furniture all at once so your whole church is redone at once, instead of in stages. There’s no need to coordinate shipments from different places and hope everything works together. With Born Again Pews, you get everything all at once for a big reveal to your congregation instead of piecemeal. We enjoy working with churches to build different pieces of church furniture. 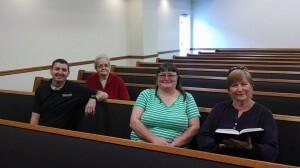 We worked with and met a number of congregation members at Amity Baptist in Hackett, Arkansas, and seeing how happy they are with their new church furniture is one of the best parts of our job. If you’d like to build custom church furniture with us, get a free quote today.